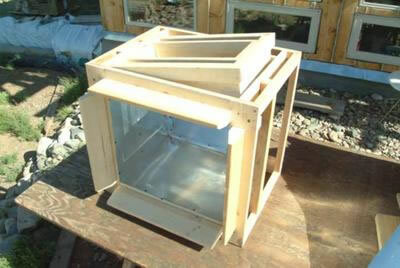 Wanting a solar oven that was big enough to hold a cookie sheet, 2 bread pans or a medium size roasting pan that worked well and could remain outside regardless of weather, I built a Permanent Solar Box Oven. It is made of wood framing and covered inside and outside with metal. The reflectors are metal roof flashing covered with reflective Mylar. It is currently mounted on a wheeled wood support to allow easy rotation and tilting. Since constructed in Summer 2009, it has been used 2-3 days every week for the past year. Its highest temperature has been only 375 degrees F as only two reflectors have mylar. But it easily reaches and maintains 300 degrees while loaded with food. In addition to cookies, breads and cakes, it has done pizza and many roasts. Roasts have included whole chicken, venison and goose. The oven has survived all types of weather, including winds over 40 MPH. It did slide a foot once, but did not tip over. 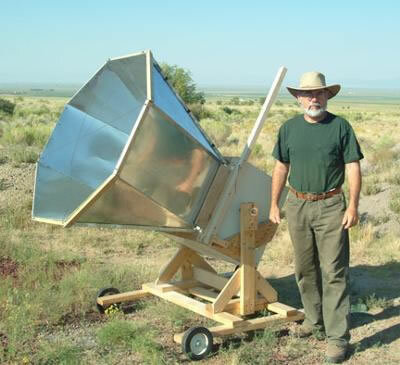 I have to say, that is a very impressive homemade solar box cooker. It looks almost like the large Villager Sun Oven, just smaller in scale...almost identical looking. You achieved with that cooker most all of the important desired aspects of a versatile solar oven. I wouldn't be surprised if someone asks you if you make and sell them. There is a gimbaled metal tray inside. It is a medium size cookie sheet attached by wire to the main pivot bolts. This keeps the food level regardless of the cooker tilt. I like that solar oven. Does the inside area have a gimbal or pivot area?